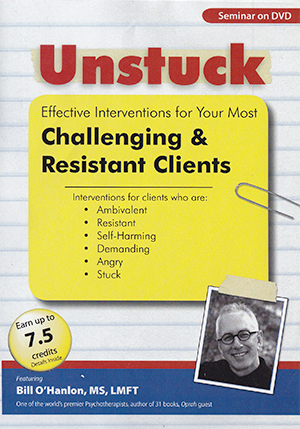 This program offers ten-plus innovative ways of getting unstuck, decreasing resistance and increasing positive results in your work. 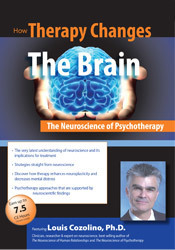 It also focuses on what therapists can do to keep themselves alive in this challenging work. Whether you are working with borderline issues, trauma survivors, substance abusers, self-hatred or self-harm, you will learn the latest most effective and empirically supported inventions to move clients towards change and optimum outcomes. Bill O’Hanlon, one the world’s premier educators and psychotherapists, makes learning fun, using humor and multi-media elements including movie clips, poetry and music, and always packs his presentations with content. Details: Multi-disc DVD recording (5 hours, 58 minutes) with electronic manual and instructions. Bill O’Hanlon, MS, LMFT, has authored or co-authored 31 books, the latest being Quick Steps to Resolving Trauma (W.W. Norton, 2010). He has published 59 articles or book chapters. His books have been translated into 16 languages. He has appeared on Oprah(with his book Do One Thing Different), The Today Show, and a variety of other television and radio programs. Bill O'Hanlon, M.S. is a dynamic, inspirational professional speaker and prolific author who helps motivate people and organizations to determine what they are meant to be doing and to remove the barriers to succeeding at those goals. Originally trained as a psychotherapist, Bill became known for his collaborative respectful approach, irreverent humor, storytelling, clear and accessible presentation style and his infectious enthusiasm for whatever he is doing. He teaches seminars, leads trainings, writes books, coaches people and offers websites, podcasts, blogs, web-based courses, teleclasses and audio and video programs. Bill is often invited as a keynote speaker, conference speaker, motivational keynote presenter and business speaker. Bill began his professional career in 1975 as a hippie transpersonal counselor at the A.R.E. (Edgar Cayce) Clinic in Phoenix, Arizona. Earlier he ran growth groups and taught seminars at the Phoenix growth center Sentheon. Deciding he really ought to know something more about what he was doing, he studied Neuro-Linguistic Programming (before they even had a name for it) and ultimately went back to school and became a marriage and family therapist. During graduate school he studied with the eccentric and creative psychiatrist Milton Erickson and became Erickson's gardener (he was Dr. Erickson's only work/study student). He was so confused and impressed by Dr. Erickson's work, he felt compelled to spend the next several years of his career writing and teaching in an effort to make Erickson's approach more understandable and accessible. Bill then moved on to develop his own method, the Solution-Oriented Approach, a brief approach to change focused on identifying and using strengths to reach goals and overcome challenges. 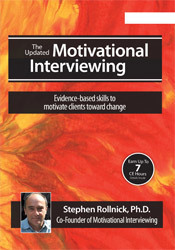 It has been applied with individuals, couples, families and organizations.